2 guard front offense starts opposite #5. #1 and 2 out front player without ball slightly behind player with ball for a safe pass back. #3 and #4 low blocks. # 5 at either side of foul line. #3 comes to wing at foul line extended. #4 comes across low block. #5 floats middle to high post. #2 comes to elbow opposite ball side. #3 passes back to #1. #2 receive pass from #1. #4 comes to wing foul line extended. #3 after passing ball to #1 comes to low block opposite ball. #5 stays opposite ball high post area. #4 comes up to foul line extended to receive a pass from #2. #4 after receiving pass waits for #3 to come across lane to low block ball side looking for pass and #5 floats across lane looking for pass to high block. #1 comes to elbow weak side for skip pass. 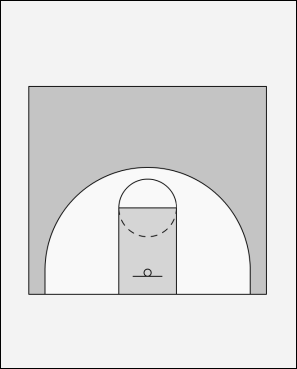 #2 moves to a position to receive a return pass to start rotation to other side of floor.